A student loan “debt relief” industry has sprung up in response to the demand for student loan borrower assistance and this report documents multiple problems as well as potential violations of consumer federal and state laws. Given the many misrepresentations uncovered, it is unlikely that these companies are providing quality services in return for the money they are charging. Such practices severely compound the pain of vulnerable consumers seeking to find resolutions to difficult student debt problems. The U.S. Department of Education should make it easier for student loan borrowers to access its borrower assistance programs, and federal and state authorities should ensure that these companies comply with the law so that consumers truly understand what services they are buying. This report builds on NCLC’s advocacy, training, and public policy work to promote access to education, lessen student debt burdens, and make loan repayment more manageable. 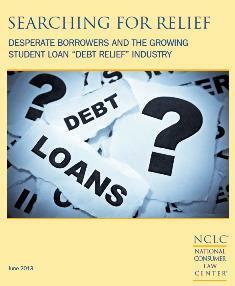 Learn more about NCLC’s Student Loan Borrower Assistance Project. High Fees. NCLC’s investigation found a range of fees charged, including initial fees up to $1600 in some cases and monthly fees for ongoing services of $20-50. The monthly fees are particularly suspect since it is unclear what services, if any, the consumer is buying on a monthly basis. Providing Inaccurate Information. The report highlights a shocking number of company inaccuracies about consolidation, garnishment, rehabilitation, bankruptcy and other critical topics. These inaccuracies are in stark contrast to the ubiquitous claims of sophisticated student loan expertise. Numerous potential legal violations of consumer protection laws, including the federal Credit Repair Organizations Act (CROA), Federal Trade Commission (FTC) Telemarketing Sales Rule, state debt settlement and debt management laws, and unauthorized practice of law provisions. Many student loan debt relief companies appear to be routinely violating all or some federal and state consumer protection laws. Some potential violations: not including a three-day cancellation right in contracts, requiring payment before initiating services, and false and deceptive advertising. Safeguarding Consumer Privacy. A number of the companies require a consumer to reveal his/her federal student loan PIN number in order to move forward with the service. This practice raises serious privacy concerns and violates U.S. Department of Education guidance. – All companies must disclose fees online and in all calls with consumers. – Companies should charge only fees that are bona fide and reasonable. – Companies must not engage in false, deceptive, or misleading advertising, including improperly stating or implying affiliations or connections with government agencies. – Companies must prominently disclose if their programs are government programs and if so that these programs are available at no cost through the government. – Claims about performance must be transparent and verifiable. – Claims about borrower rights and the requirements of student loan programs must be accurate and up to date. – Companies must not request or require borrowers to provide PIN numbers for the National Student Loan Data System (NSLDS). do not charge any fees until services are completed. However, the companies must, at a minimum, refund any funds received if the consumer does not qualify for a program or otherwise has grounds for refund. – Commissions should not be allowed based on numbers of borrowers enrolled in particular programs. – Transparency is critical. The companies must not only disclose all fees online and in response to requests for information, but also provide sample contracts upon request and verification of performance information. – Comply with all applicable consumer laws, state and federal, including cancellation rights. – Companies must comply with unauthorized practice of law provisions. with possible public funding or support from higher education institutions. Since 1969, the nonprofit National Consumer Law Center® (NCLC®) has worked for consumer justice and economic security for low-income and other disadvantaged people, including older adults, in the U.S. through its expertise in policy analysis and advocacy, publications, litigation, expert witness services, and training. www.nclc.org. NCLC’s Student Loan Borrower Assistance Project provides information about student loan rights and responsibilities for borrowers and advocates. We also seek to increase public understanding of student lending issues and to identify policy solutions to promote access to education, lessen student debt burdens, and make loan repayment more manageable. www.studentloanborrowerassistance.org.